• Minimal, easy to use user interface. 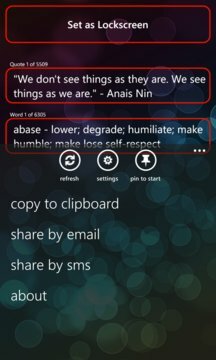 • Inspirational quotes and words right on your start screen as live tiles or as lock screen wallpaper with Bing daily image or with your own photo. • Give yourself some inspiration every time you see your phone and learn something new. • Nearly 7800 wonderful quotes for some inspiration and nearly 6300 words to improve vocabulary. • Lovely notification whenever the live tile or wallpaper is refreshed - can be turned on and off. 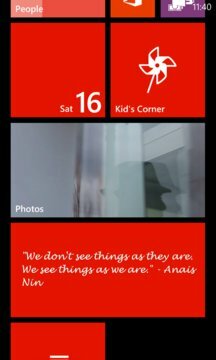 • You choose to show only quotes or words or both in the lock screen and in live tiles. • Optimize performance to improve performance and battery consumption. • Does not connect to internet for getting quotes and words, the app itself has a huge database. • Ability choose your own lovely background for the application for added inspiration. • Ability to choose your own font for live tiles and wallpaper. • Filter quotes and words that contains specific words. • Set settings shortcut for live tile. More exciting updates in the works.